At Forrest we pride ourselves on our levels of service from your first impressions via our website or walking on to our showroom right through to your furniture delivery and beyond. Our delivery service is one of the very best available in the furniture industry and all our delivery teams trained to the very highest standards. Our delivery teams understand how our furniture is produced and manufactured and have a fantastic understanding of the craftmanship that goes in to making our furniture, this ensure careful handling of your furniture at every step of the delivery process. 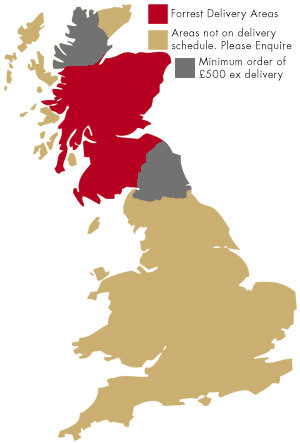 There is a standard charge per delivery for all orders delivered to an address in mainland Scotland. Our delivery service charges are distance dependant and range from £49-£89. for more enformation about our delivery service cost please get in touch. Forrest Furnishing will deliver items purchased from our Glasgow showroom and our main website website throughout Cental Scotland as shown on the map opposite. If you live in a remote area of the country outwith the areas shown on the map please contact us and we'll be more than happy to discuss the supply goods to you by a carrier of your choice. All our deliveries are carried out to the highest levels of service. Placing furniture in your room of choice and where applicable our delivery teams will endeavour to carry out basic construction (i.e. Fix legs on to dining tables). For more technical construction and/or fitting a cabinet building service can also be arranged for a small fee. For more details on our cabinet building cost please contact our showroom on 0141 300 7400. You are required to check the suitability of the furniture and order form carefully in respect of dimensions, any special uses and access to (and within) your home or premises. If, after having placed your order, you have a change of heart for whatever reason, you may cancel your order at any time prior to delivery. All you need to do is advise us in writing, either by post direct to Glasgow showroom or by e-mail. Once we acknowledge receipt of your cancellation, you will receive a full refund using the same method as your original payment. The majority of items available from our Furniture Clearance Centre website have been featured on display inour Glasgow showroom and are sold in the condition they are seen in. Any minor defects or marks will be listed on this site, where possible, but customers are urged to inspect the furniture in person prior to making a purchase. If the items bought are new and have not been on display in our showroom you will have the option of an exchange or refund within 14 days of delivery on items which have not been made or assembled, provided they are still in original and unused condition. Where you require us to collect unwanted items with our own transport you will be charged our standard delivery charge. This does not affect your stututory rights. If for any reason you are dissatisfied with your purchase please contact our customer service department who will endeavour to help you in any way they can. Customer Service: 0500 00 19 22.